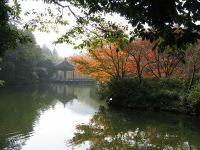 An area famed for its natural beauty, West Lake in Hangzhou is, in many ways, the landscape most representative of ancient China due to its immortalisation in art. This is where visitors will recognise those dainty 'willow pattern' scenes of waterscapes, bridges, and gardens. The lake itself is sheltered on three sides by mountains where travellers can truly feel that they have escaped the city. West Lake is a UNESCO World Heritage Site full of historical points of interest, including the various temples, pagodas, and museums. Visitors can easily hire a boat to take them to the islands in the centre of the lake, which is a lovely way to view the area. Many visitors hire bicycles and ride all the way around West Lake, a trip of about six miles (10km) depending on which route is taken. There are so many things to see and do in West Lake that visitors will need at least a day to explore. Famous scenic spots worth seeking out include Broken Bridge (the most romantic spot in West Lake), Su Causeway, Crooked Courtyard and Flower Pond.